Social Produx announces the launch of BandAbout Custom Wristbands, photographic wristbands that customers create with drag-and-drop simplicity at http://www.BandAbout.com. Customers can easily add their photos from Facebook and other sources, and free graphics, lettering, and artwork from BandAbout’s Goodies collection. Our product allows people of all ages to express their stories, affiliations, interests, beliefs, and creativity like never before. Social Produx is thrilled to introduce BandAbout Custom Wristbands, an exciting new concept in wristbands. 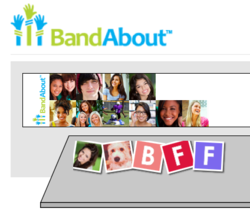 The Company’s innovative web site, http://www.BandAbout.com, features drag-and-drop simplicity, Facebook integration, and a uniquely organized graphics collection, and allows customers to create photographic wristbands using a highly intuitive visual interface. BandAbout turns customers’ designs into high-resolution printed bracelets made of a lightweight polyester material. They are recyclable, non-toxic, and proudly made in the United States. An integrated clasp design allows the bands to be resized in half-inch increments and easily taken off and put back on. The Company overcame several technical and logistical hurdles to develop a high-quality product that could be purchased inexpensively in single quantities. Customers can order just one BandAbout wristband for only $4.99, which includes free shipping in the United States. Additional copies of the same band are only $2.99. Volume pricing is available for events, fundraisers, and promotions. The Company ships worldwide. BandAbout maintains a Facebook page, http://www.facebook.com/BandAbout, featuring design ideas and inspirations, and is on Twitter at @BandAboutDotCom. BandAbout also has a YouTube page at http://www.youtube.com/BandAboutWristbands. BandAbout, the BandAbout logo, and Social Produx are trademarks of Social Produx, LLC. The BandAbout product and web site are patent pending.